Emergency is a German series of four computer "Serious Games" that revolve around micromanaging emergency services on a variety of accident and/or accident scenes: Emergency: Fighters for Life, Emergency 2: The Ultimate Fight for Life, Emergency 3: Mission Life and Emergency 4: Global Fighters for Life. 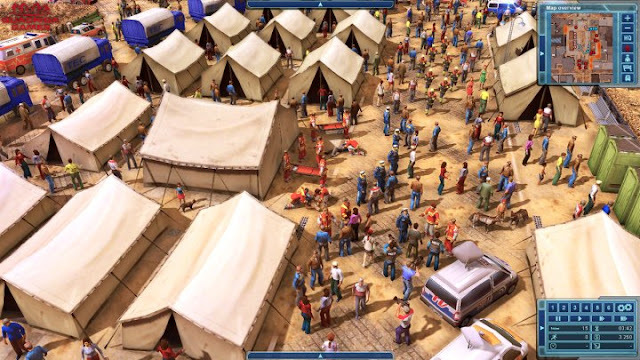 Emergency 2012: The Quest for Peace, also known as Emergency 2012, will be the fifth installment of the Emergency series developed by Quadriga Games and published by Deep Silver. The current set European release date is October 22, 2010, with a North American version planned for release on January 5, 2011. 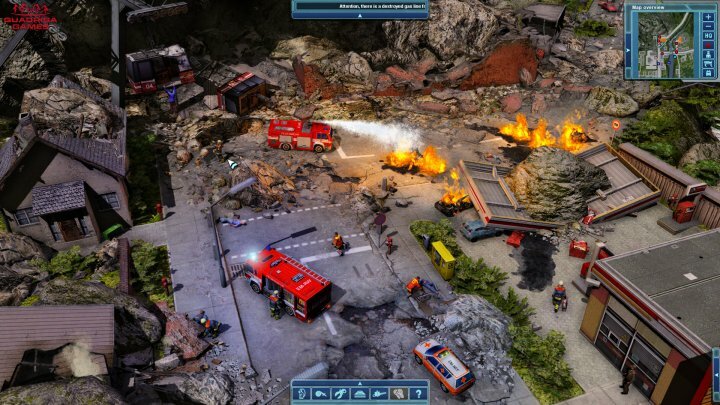 Publisher Deep Silver from Planegg near Munich, Germany, and developer Quadriga Games (Potsdam-Babelsberg, Germany) are working together on EMERGENCY 2012, a new PC title from the EMERGENCY series. Deep Silver is going to publish the title in the UK, Germany, Austria, Switzerland, the Nordic regions, Benelux, Spain, and other European countries in Q4, 2010. 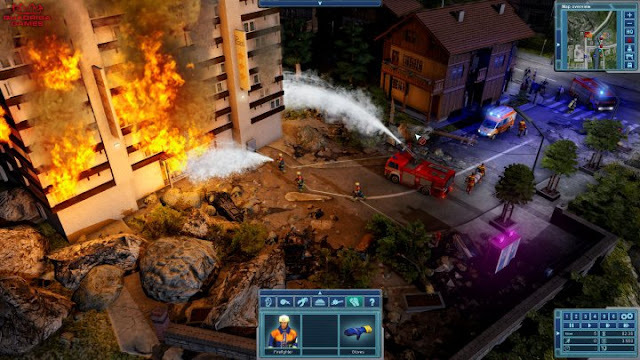 EMERGENCY is a well-established (Serious Game) brand with a loyal fan base, known for its well-balanced mixture of real-time strategy and rescue simulation. Therefore, we are very pleased that we get to publish EMERGENCY 2012,” comments Georg Larch, International Marketing Director at Deep Silver. Major cities in Germany and the rest of Europe are about to become disaster zones: An unprecedented heat wave is crippling Berlin, while Paris is threatened by riots and looting in the aftermath of a devastating storm. In EMERGENCY 2012, rescue specialists with their state-of-the-art gear await the player’s commands to restore peace and stay on top of the situation. Everything is available, from rescue helicopters and tow trucks to fire engines with turntable ladders and, as a new feature, even surveillance drones. The EMERGENCY series has pretty much shaped and established the whole rescue strategy genre. Visually, the new EMERGENCY 2012 presents itself in top form: Truly dynamic light sources let blazes flare up realistically while blue emergency lights flash and lighten up the surroundings. New shader effects and a reworked particle system further enhance the game experience. 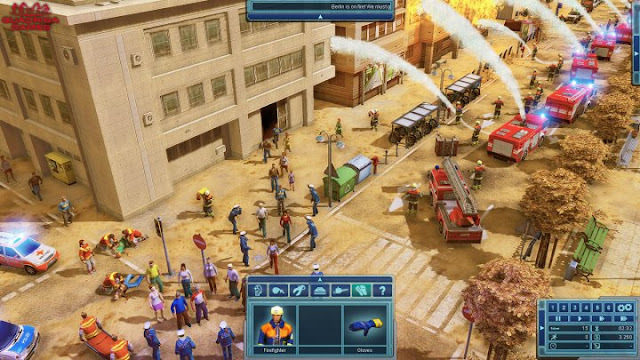 EMERGENCY 2012 is the latest installment in the classic series of rescue games. The first part appeared in 1998, and since then the series has been continued with growing success. In EMERGENCY 2012 for PC, the player acts as a dispatcher in gripping rescue missions. Get a wrecked car out of the way fast, have firefighters advance to the source of a blaze, secure a crash site and, at the same time, get medical help to those injured – if you have always wanted to direct fire services, police, technical relief units and medics all at once, the rescue simulation EMERGENCY 2012 is just the game for you. The player is the officer in charge of everything and sees to it that all vehicles and helpers are in the right place, doing the right thing at the right time. This is where the strong real-time strategy element of EMERGENCY 2012 sets in. The player must make clever use of vehicles and personnel such as police officers and rescue dog handlers in order to bring everything back under control following a disaster. Once all victims have been whisked away to safety, the player gets to enjoy the feeling of having saved the day. 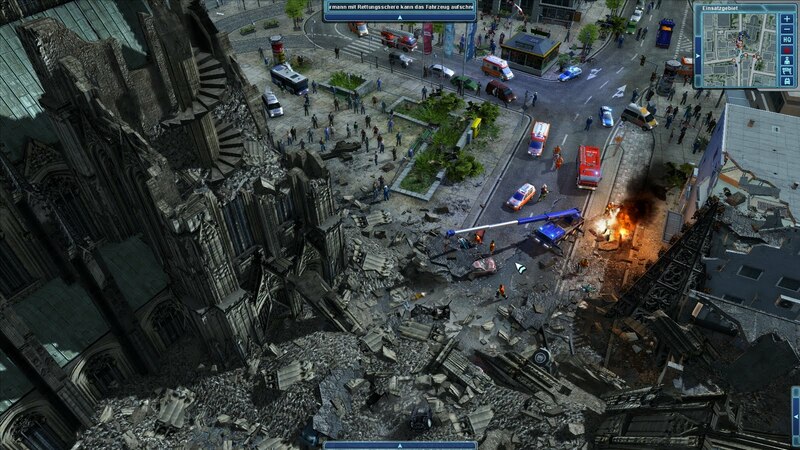 In addition to the numerous missions, EMERGENCY 2012 also offers extensive free-play and multi-player options. Quadriga Games’ creative base is in the media town of Babelsberg near Potsdam, a historic location of the German entertainment industry, where the company develops games for browsers, mobile platforms, consoles, and PC. 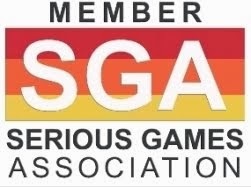 Quadriga Games is headed by industry veteran Ralph Stock, who assembled a creative and highly qualified team of experts from the classic areas of game and concept design, graphics, and programming. The focus lies on researching creative and innovative topics such as augmented reality. Moreover, as a service provider, Quadriga Games supports publishers and other businesses through strategic consulting, project planning, game design, and programming, as well as 2D/3D graphics and level design. Ralph Stock has been a computer game expert from day one. In 1984, he already published his first commercially successful computer game, The Philosopher’s Stone, for Commodore 64 and, in the early 1990s, helped with the breakthrough of cult games from Lucasfilm and SSI in Germany. As a developer, Stock invented global hits such as MAD TV or the EMERGENCY series. 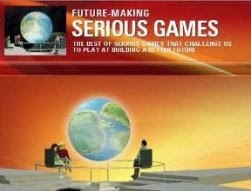 Besides heading Quadriga Games, Ralph Stock is CEO of the consulting firm Serious Games Solutions GmbH in Potsdam and other companies in the media sector. Koch Media is a leading Global Publisher and Distributor of entertainment products including Computer Games software, accessories, DVD and PC Utility Software. The company’s publishing reach, brand marketing and distribution operations extend throughout Europe and the USA. Koch Media continues to form strategic alliances with leading European and Global Software/Computer Games Developers. PC Software partners include: Kaspersky Labs, Nero, Accountz, PX Software, Cyberlink, Net Nanny, Gotham New Media, AVG Technologies, Eleco, Mr Site, Trend Micro and Corel. With Headquarters in Munich, Germany, Koch Media also has offices in Germany, England, France, Austria, Switzerland, Italy, Spain, the Nordic regions, Benelux and the USA.